In stock 76 items in stock. Note: The included CD contains all versions of the software. The version that has been tested to work with this unit is version 3.0. You can also just use the download link in the Documents Tab. 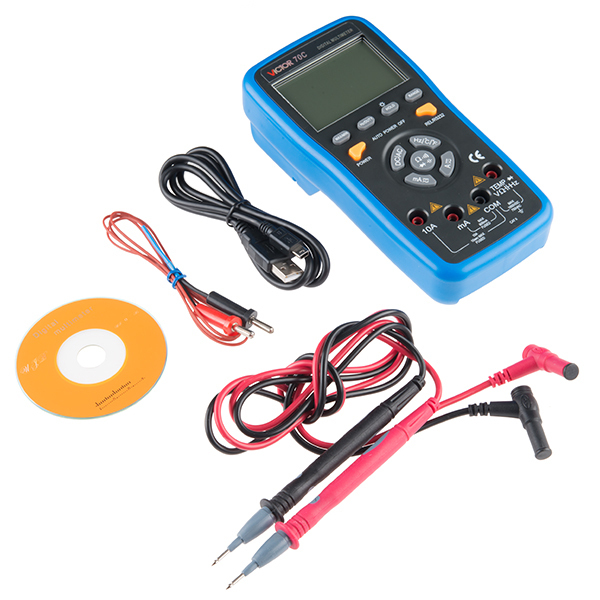 The included CD has the software to use with this multimeter. The install should also have the drivers. When connected via USB the device should enumerate as "Silicon Labs CP210x USB to UART bridge (COM##)". will this diode tester light up an LED? I have one meter that can do this but haven't found another in years... at my $70 price point..
"A digital multimeter with a Diode Test function can be used to test LEDs of various colors if the DMM applies a sufficient voltage potential at the meter leads to overcome the forward voltage requirement of the LED. The Diode Test function typically applies 2 mA of current to the diode under test. This current along with enough voltage to overcome the forward bias requirement is usually enough to illuminate most LEDs." I just bought one today, and having NO luck getting it to connect with my PC. Start gives me "open device failed". There's a dropdown for "unit" in the top center, but it is blank. No idea what's going on, but I bought it specifically to put a meter on a projector for classes. Hopefully someone from SF will chime in here, otherwise I will have to get something different. SOLVED!! Despite the instructions above, the software which is linked on this page is NOT the software that comes on the little orange CD with the meter. My laptop has no CD drive so I used the download link. BOTH versions of the software on the disk work with my meter. You have to manually try comports, but it does work. I just got this as a gift, and can't get the windows software to work. Must admit it's a bit annoying. However, it's still a nice multimeter. Does this have min/max function? Really? It clearly has an rs232 interface internally and a USB converter bolted on to cope with the current lack of serial ports on modern PCs but in 2015 a new product with closed USB drivers? Really? In 2015 it should be mandatory for a new design to not only have a standard USB interface but to have a published format for the data on the wire. And since you are supposed to be selling to people who tinker, how about expose the TTL serial interface on a header to allow it to interface to a microcontroller or your existing USB to TTL Serial interfaces? When I saw it had a USB port, I thought: "Must Buy". Then I see it has some strange driver. Well, often these devices that are not badged "USB" use an FTDI chip or one of the other USB-to-serial converters, and then squat on some random VID/PID so that they don't have to pay the USB consortium to use the logo. So... I download the .rar file. And..... I find a Windows self-extracting .exe. So far in 2015, I have not had to boot Windows, and this isn't enough to motivate me. Maybe someone that buys one of these units can look at how it enumerates itself on the USB bus, and maybe try a CDCACM driver on it by associating the VID/PID. Or maybe some Windows user can poke around the same way. In any case, the temperature probe is nice in a meter in this price range. I had to pay out for a pretty spiffy Fluke in order to get a temperature probe. Wake me when the USB connectivity works on Linux or a Mac. I'd buy it instantly if I could interface data logging scripts to it. Wake me when the USB connectivity works on Linux or a Mac. Iâd buy it instantly if I could interface data logging scripts to it. The "-0271 41" result implies: -027.1 mV. The 41 refers to the digits shown and where the decimal place goes -- 4 digits and the 1 it looks like refers to mV. If the 1 is not shown, then it means volts. Explanation: 0 (no decimal), 1 (3 decimals), 2 (2 decimals), and 4 (1 decimal). powershell "$port=new-Object System.IO.Ports.SerialPort COM8,2400,None,8,one; $port.Open();$port.Close();"
It will connect to COM8 and then disconnect. For some reason that clears up the com port and is open and ready for talking to the vbscript. Have the Mac users succeeded using this Multimeter? Member #686974, have you gotten any "sensible data out of it" yet? See my other answer above about the explanation of the digits. On my mac it showed up as a cp2102 and if I install the usb serial driver from Silabs if shows up as a serial port is this a new version of the device? I was expecting a HID device. I will let you know if I can get sensible data out of it. If it is not OS agnostic, the so-called "USB" port is useless to me. E-mail me when it is a "real" USB port. Otherwise I think it would be a valuable instrument. It's an integrated USB<->Serial adapter. You can use sigrok. Is there a MAC driver available yet? 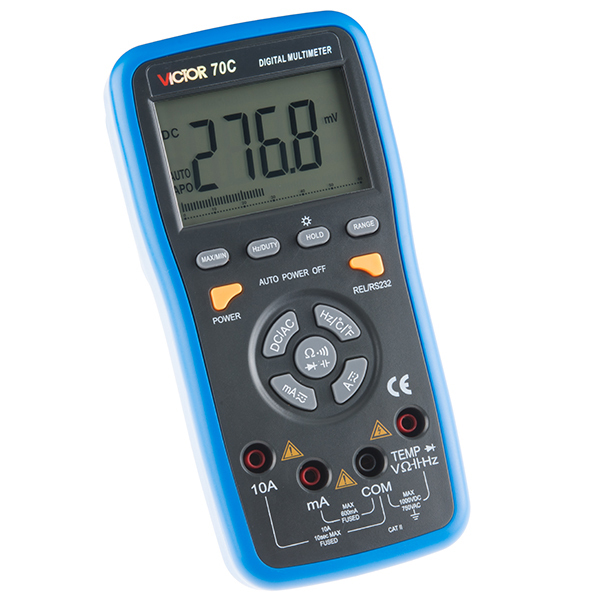 could anyone confirm if this information and linux solution for the victor70c also applies to this meter? I'd also like to know: Are the AC measurements RMS? and Is the USB electrically isolated? If not, you could run into problems quickly measuring circuits connected to an AC line. What is the resolution? Reading the manual, I get the impression that this is 3 3/4 digits. Is that correct? This appears to actually be a Victor 70C multimeter, potentially with customized firmware. The included RS232 interface software is windows only but neither it nor open-source alternatives like sigrok-cli actually worked for me (Win7/64bit), though the DMM did register as a serial port. Not much else to say here except that this device is very excellent. It lives up to the expectation of a medium cost hobby meter and the autoranging feature is very stable. Definitely a tool to recommend. This meter was affordable and digital. I looked at the yellow ones but could not justify the expense for a hobby. This has beeper for continuity checks and digital for other measurements. Works well for me. Looks like they took the Victor86C USB protocol and changed 1 or 2 things. 0 - jodenxunickxia is still the magic value for subtracting bytes 1 - I think the 'scrambler' step may have been reversed or else I'm reading the disassembly wrong. 2 - the bytes in the 14-byte packet are now bit-reversed.